By 1838, construction of the Great Western Railway linking Bristol and London was underway and there were plans for further lines to Gloucester and the Midlands and Exeter and the South West. John and Henry Stothert owned a well established ironmongery and iron founding business in Bath at this time and seized the opportunity to expand their enterprise by opening a railway locomotives and engineering equipment factory in Bristol. Their Avonside Ironworks in the St. Philip’s district of Bristol was ready in time to supply the Great Western Railway with the two Firefly-class engines used to haul the first scheduled passenger trains between Bristol and Bath on 31 August 1840. A view of the erecting shop of the Avonside Engine Company taken in the early 20th century. Edward Slaughter, one of Brunel’s assistant engineers from the Great Western Railway, joined Henry Stothert in 1841 as a partner. Their firm­ Stothert & Slaughter, became well known at home and abroad as a manufacturer of mainline passenger and freight locomotives. It was renamed the Avonside Engine Company in 1864 and prospered for another decade, only to become bankrupt at the end of the 1870s. This was due to its failure to adapt to changes in the industry as British railway companies established their own locomotive works and competition from European and American manufacturers for export business increased. A new Avonside Engine Company was set up in 1882 by Edwin Walker whose own locomotive engineering business in Bristol, Fox Walker and Co. had also failed to survive the serious trade recession at the end of the 1870s. Walker leased part of the original Avonside Engine Company’s works site and concentrated on industrial tank engines for the home market and larger locomotives for export. 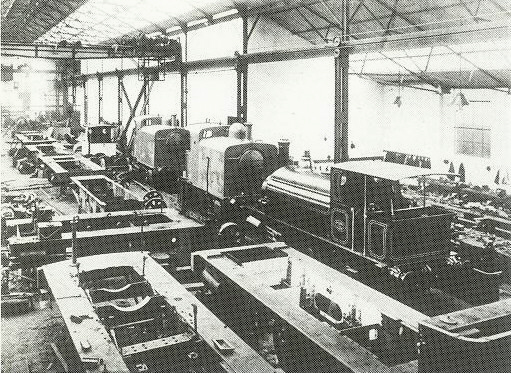 Although never able to regain the commanding position in British locomotive engineering that the old company had achieved, Avonside remained a respected firm for a further 50 years, moving in 1905 to new premises in Filwood Road, adjoining Fishponds Station, on the outskirts of Bristol. This is where Portbury was built in 1917. In 1934, the business was taken over by the Hunslet Engine Company of Leeds and the Filwood Road works closed just a few years short of the centenary of the start of locomotive engineering in Bristol. The Avonside Engine Company received an order on 21 December 1916 from the British government for a batch of nine B4-class engines; the specification is marked: ‘these locomotives are for the War Office and delivery is of the utmost importance’. Railway trains hauled by steam locomotives were then the primary means of distributing fuel, materials and freight in large factories, docks, power-stations and major construction sites. The Inland Waterways and Docks Board of the War Office maintained a large fleet of engines like Portbury to work naval dockyards and harbour installations. Portbury and another engine from the same batch were delivered from the Filwood Road works in 1917 to Sheephouse Farm, Easton-in-Gordano, some six miles west of Bristol along the Great Western Railway branch-line to Portishead. She was to be used on the construction of a new shipyard intended for the building of cargo vessels to replace those being lost during the First World War. 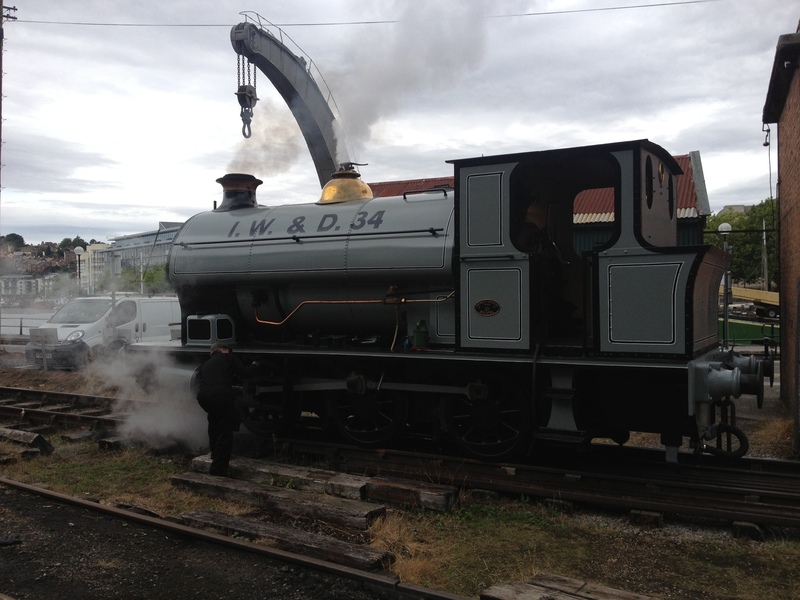 The locomotive was painted battleship grey with I. W. & D. 34 on the sides of her watertank. Managed by the National Shipyard Company set up by the British government in July 1917, the construction of Portbury Shipyard was well advanced when the war ended in 1918. Over 1,000 troops of the Royal Engineers had worked on the project which cost £238,000; a workers’ accommodation camp, railway sidings and a station had been constructed. No ships were ever built there but the construction camp and railway sidings were subsequently used during the 1920s as a government central stores depot. Sales of surplus wartime and government equipment, including I. W. & D. locomotives, were held there from time to time. Portbury’s sister locos, I W & D 35 (1765), 36 (1784), 37 (1785) and 38 (1786) were shipped to France by the war office. The Bristol Corporation Docks Committee (known after 1926 as the Port of Bristol Authority) was responsible for managing three dock systems: the City Docks, Portishead Dock which was opened in 1879, and the Avonmouth and Royal Edward Docks which opened in 1877 and were extended in 1908. The Great Western Railway worked all rail traffic in the City Docks, but the Bristol Docks Committee maintained its own fleet of shunting locomotives to move freight and passenger trains about within the docks at Avonmouth and Portishead. I. W. & D. locomotive number 34 (GWR reg. 135-1926) was acquired by the Docks Committee in February 1919 for the sum of £1940 (works order no. 3250), and named Portbury. The first surviving reference to her working as one of the Port of Bristol’s engines occurs in 1925 when the Docks Committee authorised the expenditure of £464 for a new copper fire-box. This was supplied, ironically, by Thomas Peckett & Sons, the rival Bristol firm of locomotive engineers at this time. They had taken over Fox Walker & Co. in 1882 and concentrated almost exclusively on industrial engine production. They often appear to have been at an advantage compared with the older-established Avonside Company, frequently under-cutting prices for new engines, repair work or replacement parts. The Port of Bristol bought 19 Peckett but only 8 Avonside engines between 1887 and 1937. By 1939, the Port of Bristol Authority locomotive fleet comprised some 28 engines. Every engine was worked to the limits of its capacity; Portbury still bears the evidence of damage and wear-and-tear sustained in more than 40 years of hard work in a busy port. In 1947 the Docks Engineer reported ‘gross overloading’ of all the Port’s locomotives as they hauled heavy trains round the small radius curves of the docks railway system. Portbury, together with four other Avonside locomotives, made up the second of six classes of engine then in use at the port. These were being overloaded the most by 67 per cent, regularly pulling 30 oil tank-wagons instead of the maximum of 18 which the Avonside Engine Company’ specification indicated they could cope with. However, the staff of the railway department at Avonmouth Docks knew each engine’s characteristics and its power, and it was reckoned that in her hey­day, Portbury would ‘pull a town down’. She is also remembered by Port engine crews in later years as displaying a tendency to ‘go off on her own’. It was not uncommon for a steam locomotive to move off if left unattended, particularly if the regulator valve was worn and the valve-gear needed adjustment. Portbury was therefore usually parked in the locomotive shed at Avonmouth between other engines to make sure that she stayed put until needed for the next shift! The Port’s steam locomotives worked alongside, and were then replaced by a fleet of diesel engines during the 1950s. By 1964 Portbury was parked with one of the Port’s Class 1 Peckett engines, Henbury, in ‘E’ Shed – a tea warehouse at Avonmouth – having been donated to the City Museum’s Technology Collection. During the 1970s Portbury was moved several times, first to Radstock in November 1971, then to Washford in March 1975 and then back to Avonmouth in 1980. The plan had been for the team of volunteers from the Somerset and Dorset Railway Trust which rebuilt Henbury to working order in 1973, to do likewise with Portbury. However, they were unable to attend to her and so in 1985 she was brought by road to the Industrial Museum which had been established in 1978 to house and display the City Museum’s Technology Collection. In July 1986, the team of volunteers from the Industrial Museum’s Bristol Harbour Railway erected a temporary workshop at the back of the museum and dismantled Portbury. Considerable amounts of time, ingenuity and some £14,500 were expended to refurbish and rebuild every part of the locomotive including re-tubing the boiler. The work was completed during the spring of 1988 and Portbury worked in steam again for the first time for almost 30 years on 5 June, 71 years after she was built. Portbury was painted in a lined blue livery during the 1990s, before her overhaul in 2001, when she was repainted into the battleship grey of IW&D (Inland Waterways and Docks) she was delivered in. After the expiry of her 10-year boiler ticket, she was overhauled once more, partially at M Shed with work also carried out at South Devon Engineering at Buckfastleigh, and reintroduced into service in 2013. Her livery has been altered to more accurately represent her 1917 condition, with black wheels and without nameplates. I worked on restoring Portbury in the ’80s (while I was at school in the area), and am pleased to see that the engine still runs. In those days it was just a handful of volunteers running short trips up and down the harbour, and it was a really fun time. I wonder if John and Chris are still associated with the railway? I have 2/1919 to Bristol. Reg GWR 135-1926.Loco cost £1940,works order no 3250. 1964 stored for Bristol City Museum,scheme abanandoned 11/71 Radstock,scheme abandoned,3/76 WSR. Thanks John! I’ve added the info in. That chimney..? No explanation of what looks suspiciously like the Swindon variant!